LH front door panel shown; RH side similar. Disconnect the battery positive and negative terminal. 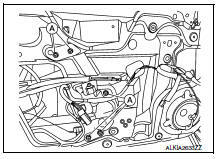 Refer to PG-50, "Removal and Installation (Battery)". 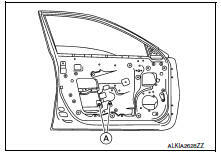 Temporarily reconnect both battery terminals and the main power window and door lock/unlock switch (LH door) or power window and door lock/unlock switch (RH door) to raise/lower the door glass until the door glass bolts can be seen through the access holes. Remove the front door regulator to glass bolts (A). Raise the front door glass and hold with a suction lifter (A). Disconnect the harness connector from the front door glass regulator motor. Remove front door glass regulator bolts (A) and the front door glass regulator. 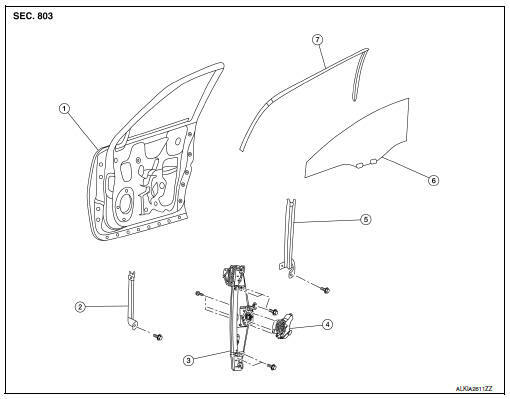 Check the front door glass regulator for the following items. If a malfunction is detected, replace the regulator. If any of the following occur, system initialization must be performed. Electric power supply to power window switch or motor is interrupted by blown fuse or disconnecting battery cable, etc. Removal and installation of the regulator assembly. Removal and installation of the motor from the regulator assembly. Removal and installation of the harness connector of the power window switch. 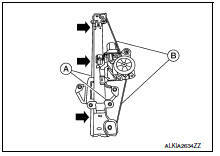 Operation of the regulator assembly as a unit. Removal and installation of the door glass. Removal and installation of the door glass run. Window is partly opened and or closed multiple times with out being fully closed. To perform system initialization, refer to PWC-29, "Work Procedure". INSPECT THE FUNCTION OF THE ANTI-PINCH SYSTEM. To inspect the anti-pinch system, refer to PWC-29, "Work Procedure".